A mass of glass and aluminum, the Z3 Play is every bit the premium smartphone that Motorola needs to round out its Moto G and Moto E line of mid-tier and budget devices. It’s a device that stands out in terms of design, aesthetic and tech specs, but one that also continues the recent Moto tradition of modularity. Last year’s Moto Z2 Play was an undeniably attractive device that stood out for its dated look. With a large fingerprint scanner and noticeable top and bottom bezels, the Z2 Play’s slender profile was blemished by the fact that the device looked bigger than it really was. This year, it seems that Motorola has learned from its mistakes, and has dramatically trimmed the Z3 Play’s forehead and chin. The phone still bears the company’s branding on its bottom bezel, but the smartphone now truly looks like a modern device. 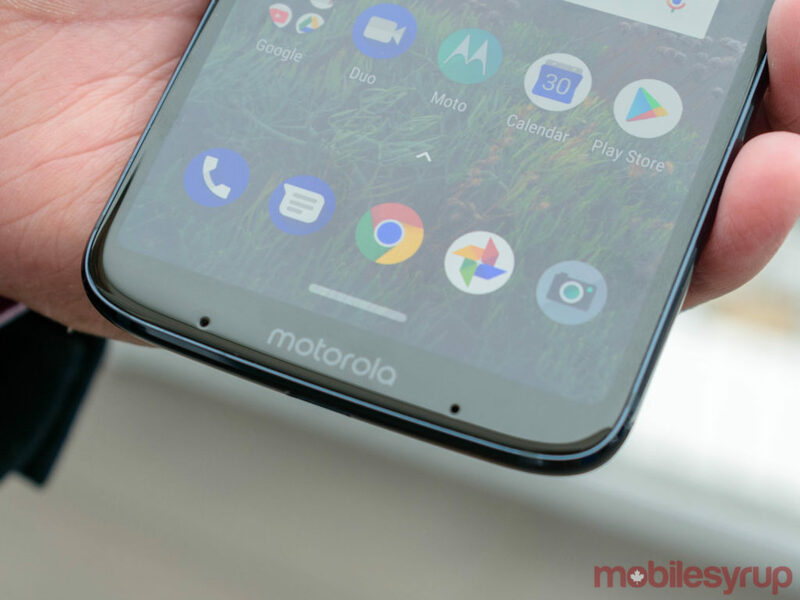 In order to accommodate the slimmer bottom bezel, Motorola opted to move the device’s fingerprint sensor to the right side — underneath the phone’s volume keys. The Z3 Play’s power button is on the left side of the device, which makes for incredibly curious button placement. Don’t get me wrong, while the device comes with now-fashionable face unlock software, I’m glad that Motorola still chose to include a fingerprint sensor. Why the fingerprint sensor isn’t on the back of the phone or embedded into the device’s power button — like on a slew of older Sony Xperia Android smartphones — is a design choice that’s lost on me. 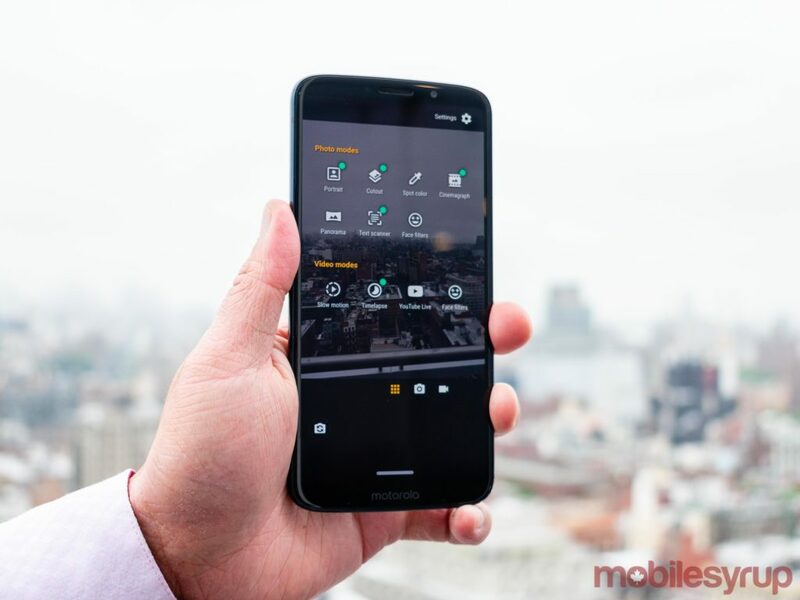 The issue of Moto modernity, however, is a curious one, as the Moto Z3 Play is a device that seems ready to embrace the smartphone future but that’s still stuck in the smartphone past. 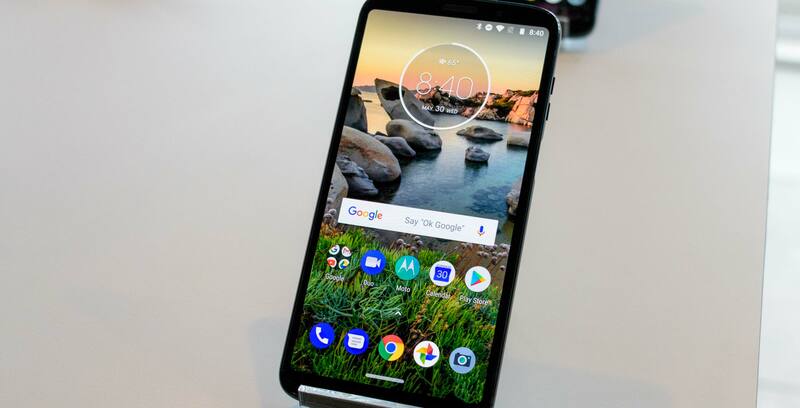 For instance, the Moto Z3 Play rocks an almost bezel-less 6.01-inch Super AMOLED display with a 2160 x 1080p resolution and an 18:9 aspect ratio. In my admittedly limited testing, I was impressed with the screen’s brightness and overall vibrancy. More use is required before a comparison can be made between other phones with OLED panels, but the Z3 Play certainly isn’t going to lose any points for its screen. The phone’s dual-rear camera setup — with one 12-megapixel lens and one 5-megapixel depth lens — is yet another welcome modern tweak. The phone is also outfitted with a Qualcomm Snapdragon 636 processor, 4GB of RAM, 32GB of internal storage — 64GB in certain regions. The device carries a 3,000mAh battery that Motorola claims can be charged to provide “half a day’s power in half an hour” using a 15W TurboPower charger included in the box. Speaking of modern trimmings, Motorola’s Z3 Play quietly does away with the 3.5mm headphone jack that was available even on the incredibly slim Z2 Play. 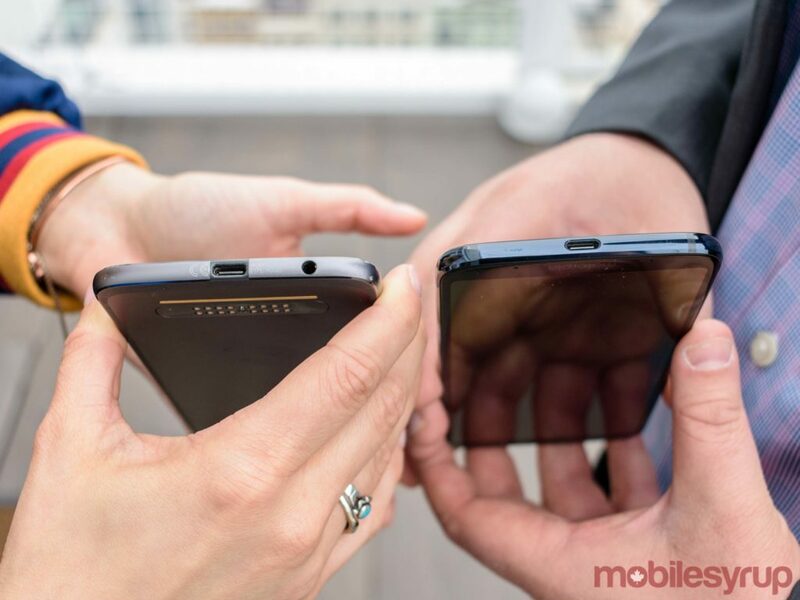 However, while the phone’s modern design is certainly a welcome refresh, the Z3 Play is stuck in the past due to Motorola’s insistence on encouraging the use of its modular Moto Mods accessories. Modularity was an incredibly popular talking point thanks to devices like Google’s Project Ara prototype and LG G5, but the subject of modifying one’s device through external hardware tweaks hasn’t been one that’s resonated with consumers. This lack of consumer interest is what makes Motorola’s obsession with Moto Mods so intriguing. 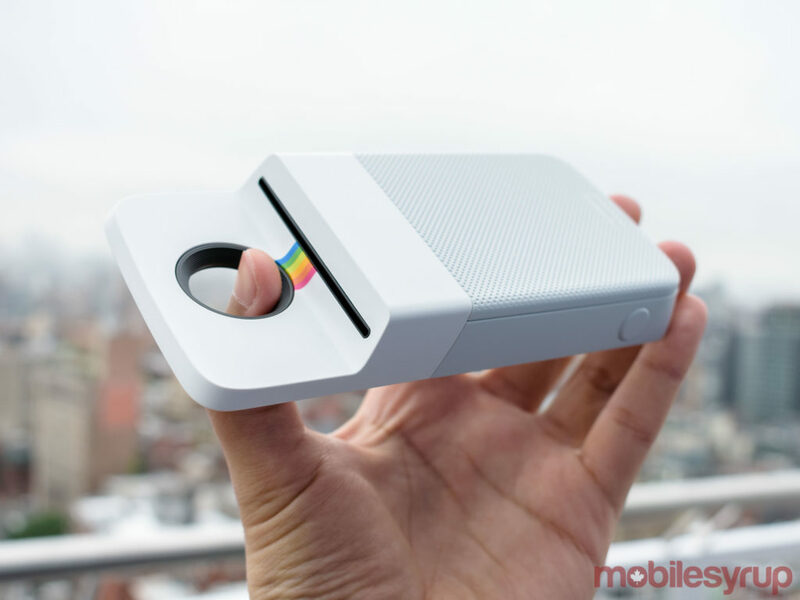 Motorola sells about 18 Moto Mods around the world (though only a fraction of those are available in Canada), and these mods range from the obvious and mundane — battery packs, speaker attachments, wireless charging shells and 360-degree cameras — to the more unusual. 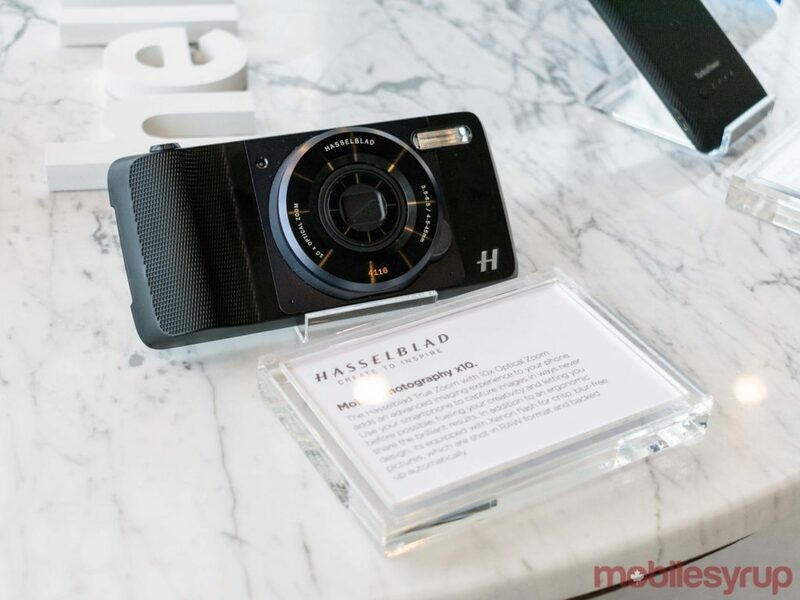 For instance, Motorola sells a $200 USD camera lens attachment manufactured by legendary Swedish camera manufacturer Hasselblad, a $200 USD photo printer attachment sold by U.S. camera company Polaroid and even a $300 projector capable of displaying an image up to 70-inches on any surface. The fact remains that Moto Mods aren’t harming anyone. If you don’t want to buy a single Moto Mod, you don’t have to, and to Motorola’s credit, none of the Mod-compatible devices have ever truly been lacking in any tangible way — certainly not at the often low cost at which Motorola prices its products. All of which is to say, if you want to buy the Hasselblad camera attachment, you’re more than welcome to do so, but if you’d rather not, no one’s forcing you to buy it. To Motorola’s further credit, rather than forcing existing Mods owners to purchase new Moto Mods for the Z3 Play, the company simply made their 2018 flagship compatible with all existing Mods on the market. In a world in which companies often ignores consumer demands by forcing individuals to buy dongles, new chargers and new hardware to accommodate design refreshes, it’s almost thrilling to see Motorola allowing users to cling to older Moto Mods. The Z3 Play’s previously mentioned dual-rear camera setup also provide users with a number of camera effects that return from the Moto G6. Portrait mode, spot colour and face filters are all back, and are now joined by ‘Cinemagraphs,’ a feature that allows users to record actions in motion, isolate individuals aspects and create an infinitely looping GIF. In my testing, I was able to record an individual pouring liquid out of a bottle, isolate the movement of the water from the bottle into the glass and turn the recording into a GIF that made it seem like the bottle was pouring forever. Also returning from the Moto G6 are landmark and object recognition, a text scanner and a text translator. Unlike the Moto G6, which utilized proprietary Motorola software, the Z3 Play’s features are powered by Google Lens. \In my limited testing, the feature was slightly more effective than on the Moto G6, though this too will require more testing. In terms of video prowess, the rear cameras are able to record video up to 4K Ultra HD at 30 frames-per-second, while the front-facing 8-megapixel camera is able to record up to 1080p video at 30 frames-per-second. The front-facing camera is also an 84-degree wide-angle lens, meaning that it allows users to capture more cinematic photos and videos — if they so choose. That 4K Ultra HD video quality might seem impressive, but it’s important to note that almost every flagship Android phone released in 2018 is capable of recording at the Z3 Play’s 4K UHD quality at 30 frames-per-second at minimum. Some devices, like the Samsung Galaxy S9, are capable of 4K UHD at 60 frames-per-second. Interestingly enough, the Moto Z3 Play’s most interesting new feature isn’t a major hardware refresh or a software overhaul. Instead, it’s a small software tweak: navigation gestures. Users can navigate the Z3 Play by using the small bar on the bottom of the screen. It looks a little bit like Android P’s gesture bar, but the Z3 Play’s pill-shaped home button provides mimics the gestures on the Z2 Play’s home button. A simple tap takes users to the home screen, a swipe to the right activates multitasking, while a swipe to left serves as the ‘Back’ button. 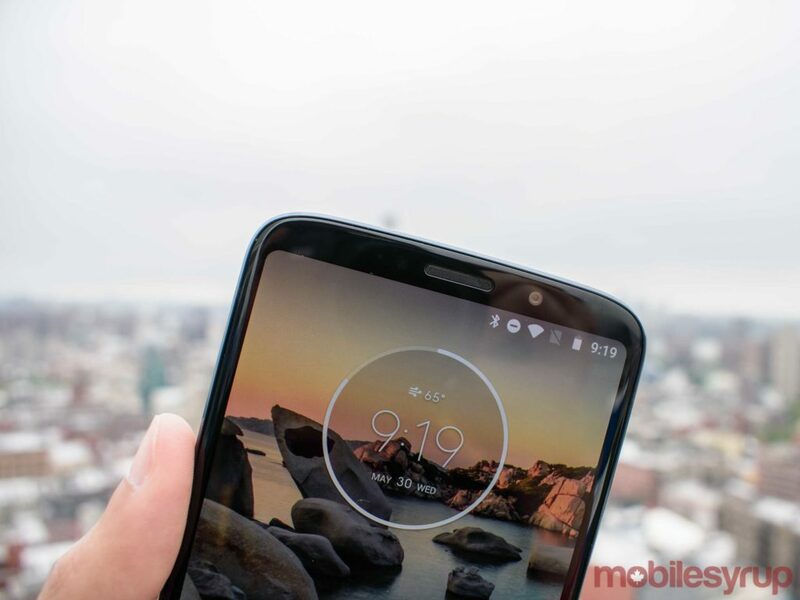 Of course, owing to the fact that these new gestures are part of Motorola’s suite of Moto Experiences, users have the option of disabling gestures in favour of using the traditional Android navigation pane. 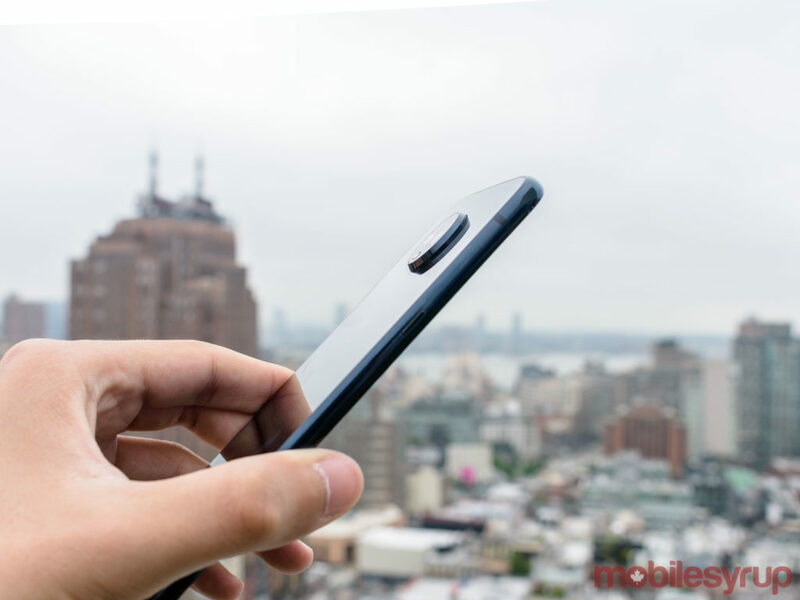 Motorola was able to confirm that the Moto Z3 Play will be available “this summer” at Videotron, Bell Mobility, Virgin Mobile, Bell MTS and SaskTel stores. The device will retail for $0 on contract but no word yet on the unlocked pricing. Check in with MobileSyrup later this year for carrier pricing once that becomes available. 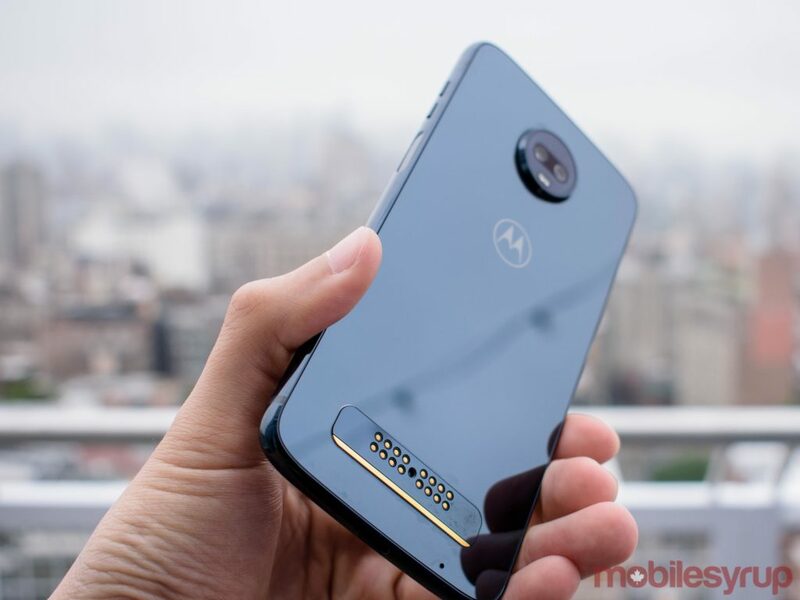 U.S. customers will be able to purchase the Moto Z3 Play in a bundle with a battery Moto Mod, but it’s unclear if that bundle will be available in Canada. Once again, check in MobileSyrup for details regarding which Moto Mods will be bundled with the Z3 Play.